What is SAP and What is SAP ECP? What is Message Server in SAP? Message Server is nothing but a Information Server. It is an intermediate channel for SAP application and server. The SAP Applications are installed in all the offices under Department of Post in connection with implementation of CSI Rollout. 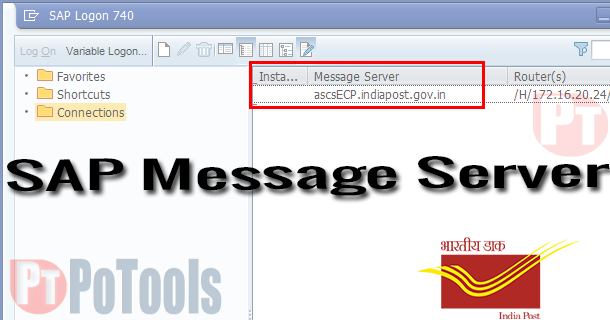 The tasks are performed by the Message server in SAP. It plays major role as it is initiating or connecting the SAP Application with SAP Server. Load balancing is handled by this message server. i.e SAP is running in more number of server, we may take as 5 Server. This server will assign the SAP Server based on load of server. Hence, the load balancing is well maintained using this server. This server will create and maintain the user logs for future reference. This article is written by the Admin, PoTools based on understanding about the above topic from various site. The author is not responsible for this article. The Message server configuration is done in SAP Application through LOGON. It may be seen in the property of concern modules configured in the logon screen. You can see the how many servers are connected by using the Message Server. The listed servers in Group/Server dropdown are up condition. In sometimes, one of the available server may not accessible due to overload. Error “Logon balancing error 88. Cannot connect to message server (rc=9)” popping up every time you logon to the SAP system.